A top loading kiln is for private artists (china painting, pottery, ceramics), ceramic cafés or small potteries. Also kindergartens or schools use a top loading kiln in their art departments! Nabertherm manufactures also each top loading kiln in Lilienthal / northern Germany. 350 employees in the factory take care every day about each kiln and furnace for pottery, glass, laboratory or even industrial applications like foundry, heat treatment of metal or technical ceramics or other advanced materials. Every top loading kiln includes already in the standard version a large scope of delivery. Multilayer, energy saving, high performance insulation is standard as well as well designed heating elements for a long life time. You don’t have to study kiln technology to operate a top loading kiln. The controller of each top loading kiln is intuitive to use. Strong gas dampers ensure an easy opening even of every top loading kiln. The structured stainless steel looks very attractive and guarantees a long life time. For a good chamber atmosphere – especially for sensitive glazes – a Nabertherm top loading kiln is equipped with a ventilation. 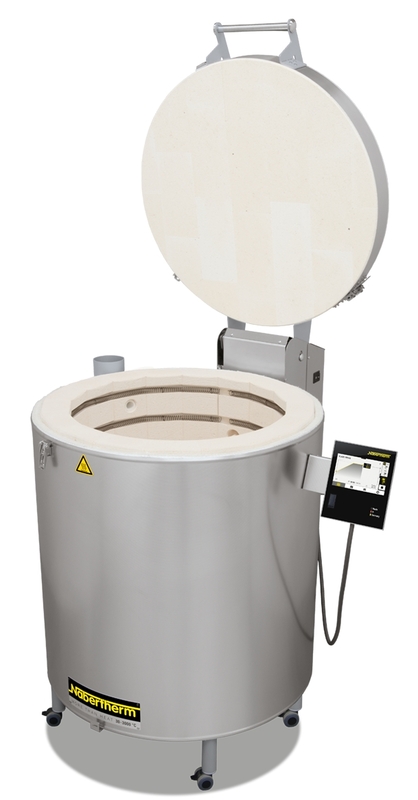 The most common types of a top loading kiln are available from stock with controller B130. Spare parts will be delivered at fair prices also for old kilns. Further information on Nabertherm top loading kiln.